Cauliflower rice is a great alternative to real rice, and you will be amazed at how similar it looks and tastes. Why would you want to eat cauliflower rice when you can eat actual rice! Following the Paleo diet does mean that grains in general are excluded from the diet as they contain a nutritional profile that we are not genetically designed for which can wreak havoc on our digestive systems and overall health. For me the main reasons why cauliflower rice is a better choice than white or brown rice focus on: 1/Gut health -for those of us with issues such as a leaky gut, vitamin and mineral deficiencies, irritable bowel syndrome and food intolerances, 2/Nutrition-more readily available nutrients and no anti-nutrients, 3/Weight management-lower in kilojoules, 4/Balancing blood sugar levels-rice is a very concentrated form of carbohydrate. Cauliflower is an amazingly nutritious vegetable that is low in fat and carbohydrates and has some wonderful vitamins and minerals such as Vitamin C and the B complex vitamins which can help to keep you healthy, protect against certain cancers, boost your immune system as well as lots of wonderful minerals such as manganese, copper, iron, calcium and potassium. Cauliflower has a glycaemic index (GI) of just 15 making it a very low GI food which helps to slow down its digestion and maintain healthy blood sugar levels. The GI is from 1 to 100 and white rice is on the high end of the scale with a GI of 65 and brown rice slightly lower at 55. Rice, especially white rice is a high starch food and will break down and covert to glucose very quickly in the body causing blood sugar peaks unless it is used immediately as an energy source as for example in very active people. For everyone else this can be a problem as the body needs to deal with the influx of glucose into the bloodstream. Brown rice has an outer casing of bran and husk which takes longer to break down but this can in itself cause problems in the digestive tract as the brown rice is hard to digest and irritating to the gut lining. The outer layer of the brown rice contains anti-nutrients called phytates and lectins which bind to minerals such as copper, zinc, iron, magnesium and calcium so that they are unable to be absorbed. This can therefore reduce the nutritional value of the brown rice and impact the absorption of other nutrients being consumed. Cauliflower is also lower in kilojoules than rice, with one cup of cauliflower having just 104 kilojoules compared to one cup of cooked rice which has 804 kilojoules. 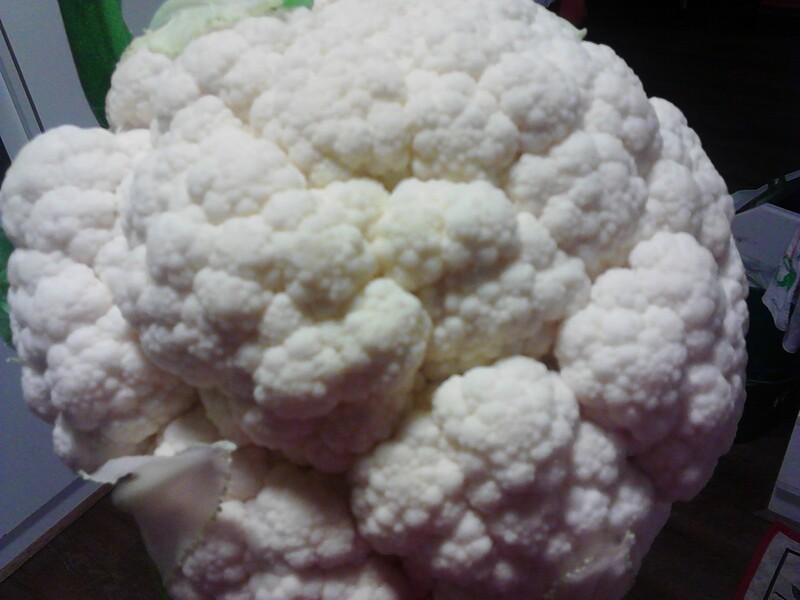 Cauliflower is also much quicker to cook than rice, especially brown rice and is very versatile in how it can be used. All of the reasons l have discussed are important to me as my health issues are centered around my gut health and issues regarding malabsorption of nutrients. Cauliflower rice is a good choice for me as a healing diet is one which enhances health and wellbeing and over the past two years l have slowly been adapting my diet to support my wellness goals. I take a lot of nutritional supplements daily as well which are very costly and l do not want to be eating any foods which would impact the absorption of these vital nutrients. How to make cauliflower rice! My favourite way to make cauliflower rice is to cut the fresh cauliflower into smallish pieces and then blend it in the food processor. Process the cauliflower until it resembles rice and is an even consistency. The rice is now ready to use in your favourite dishes. The cauliflower rice can now be added to a pan and lightly cooked such as in a stir fry. Place fresh vegetables into the pan with the cauliflower rice. The whole dish will be ready in minutes. The cauliflower will soak up any spices that are added and change colour. Add spices to the pan such as cumin and tumeric and watch the rice change colour. Another method is to steam the cauliflower pieces first and them process them in the food processor and then you can have it plain or just give it a quick cook in the pan with the fresh ingredients. The cauliflower is in the steamer. It can also be mashed with a fork using this method if you don’t have a food processor. Some lovely colours can be created with the cauliflower as it soaks up the juices and spices. Below is a dish l cooked with the first photo showing the raw ingredients and then the development of the colour once the dish is cooked in the second photo. A beautiful colour has developed from the combination of the tumeric and beetroot. Sometimes the cost of cauliflowers can be quite high but when in season this cruciferous vegetable can be purchased very cheaply which is a good time to experiment with this dish. It is very easy to use a whole cauliflower if you are making enough for the family, or if you want to take some for lunch the next day. The smell of just cooked cauliflower is so delicious, and this is especially true when steaming it. I hope that you give the cauliflower rice a try and think about whether rice as a staple food in your life is a good idea, or that maybe it is a sometimes food and best eaten with lots of healthy vegetables as part of a balanced meal.